Analysis Lotto - Find out how any winning lotto number can be picked from only fifteen numbers. Which bet would you rather take, 6 numbers between 1-50 -OR- 6 numbers between 1-15? Really, this program will show you that nearly any winning lotto number can be picked from only 15 numbers. This lotto software utility is based on the unique Delta system, based on differences between numbers, discussed at our website. It happens that Delta representations of winning lotto and keno numbers have some very interesting characteristics. Low Deltas like 1,2, or 3 are much more likely than higher Deltas, for example. The program incorporates Deltas into eight systems for analyzing lotto, keno, and lottery numbers. 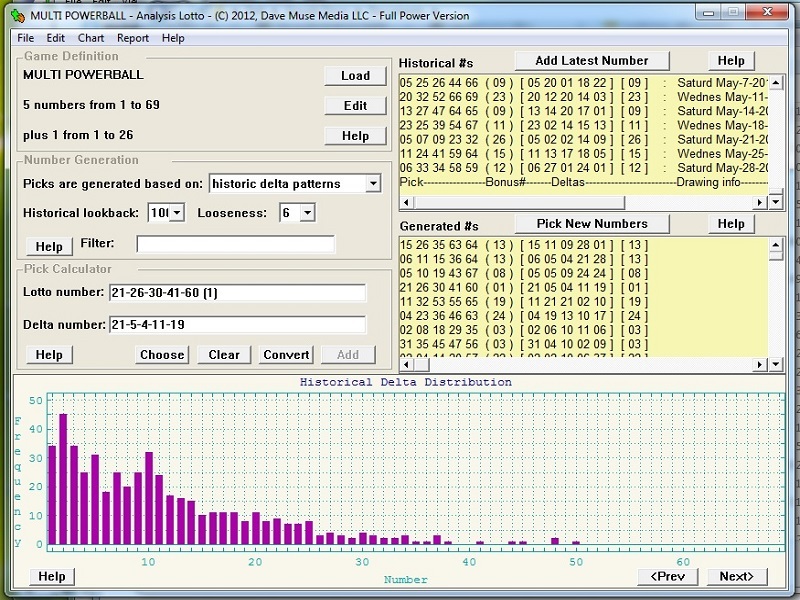 Picks can be based on historical data, Delta calculations, typical number patterns and more. Stores and statistically analyzes data for as many games as you wish to play. Each game can have its own data, its own system and other parameters. Powerful import engine makes sense out of lotto data from almost anywhere. Unique Filter feature lets you analyze only the data you want to - you can separate drawings by day of the week, by ballsets, or anything else you can think of. Multiple charts for number distribution, Delta numbers, and number trends. But this is not software only for math nerds - nearly 100 popular games come already set up, ready to play in a button-push. And adding new games is a snap.